I like the watch face and the way you did it. I love eco and recycled things that look great and this does. Collecting watches that people don’t want any more and then dressing them us as beautiful as this is a great idea. One may want to wear it on a day they need to be cheered up and not on a day when they have to look more business like. Paper beads, what a great thing to teach older kids in a party form. Glad to see you are doing the one per day project as well. That should get you attention! 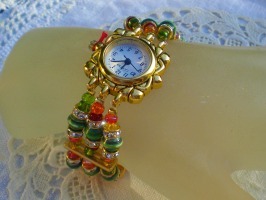 I love how this watch turned out Janice! I love bling! Great job! I love these watches! 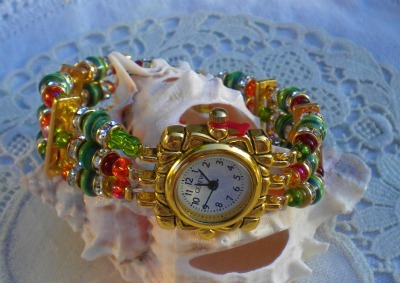 and even if it is too “bling-bling” for me, I love the green paper beads that are mixed with crystal beads in all colors! this mixture so punchy is perfectly successful! (although personally I prefer with silver …) it must be so nice to wear !